Please feel free to contact us regarding any questions you might have at awddogstudios@comcast.net﻿﻿. Or fill out handy listing to the below. Stationary products are subject to back order. Back orders are 2 - 4 weeks. Items are shipped via USPS and UPS. If in stock, prints and ceramic items will ship in 1-3 business days. Paintings and commissioned work will ship as soon as possible. At this time we only ship in the continential US. 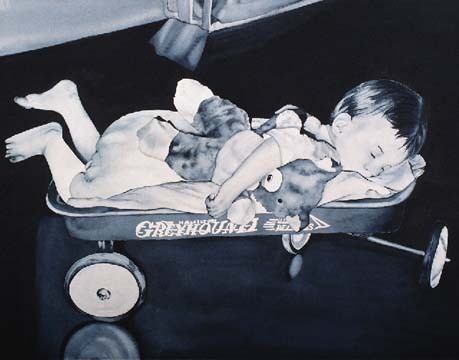 He still sleeps anywhere...; 22" x 34"; Watercolor on paper.